8.9 x 6.5 x 3.6 cm. This is an incredible, glowing rose quartz that is literally rosy and not just "pink," from a small new find here collected around January of 2008. The Pitorra Mine is well known for its large rose quartz crystals, but it is not so well known for specimens with such intense color, or an association with clear quartz as well - most are floating free of matrix and association. 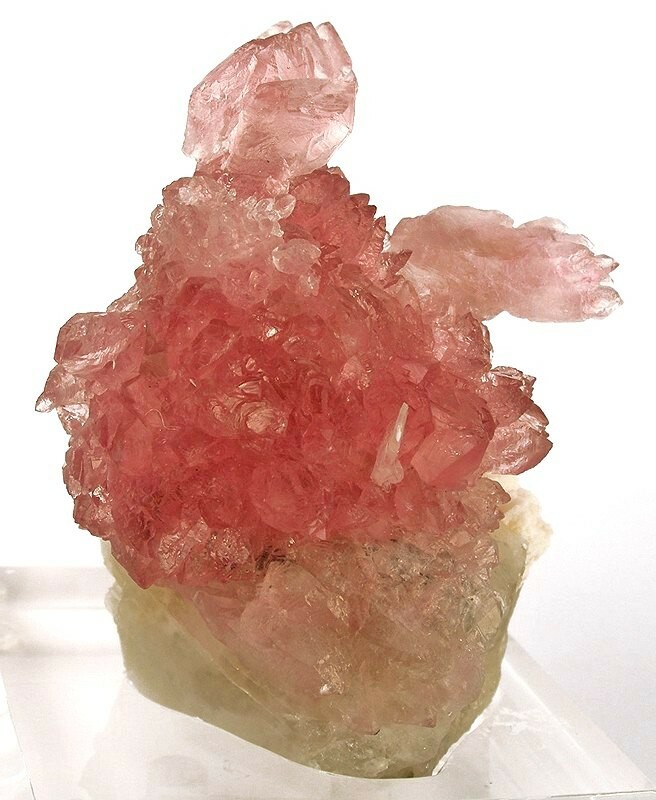 Aside from the color, though, the specimen has large, fine, translucent crystals and a good aesthetic form in both the crystal cluster itself, and in the way it is perched on contrasting matrix. This is a rare example where a specimen of rose quartz from modern production in Brazil matches head to head with the classic old material from the late 1960s and early 1970s from other mines in this area. This one has bigger, more translucent crystals as well, compared to the Sapucaia finds.